Nearly a year after the Rotarun Ski Club unveiled its master development plan, one of the major improvements to the ski area will be literally falling into place. 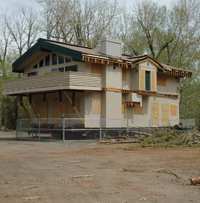 On Wednesday, May 21, the old Sun Valley Heli-Ski Guides building, which was relocated from its previous home on First Avenue in Ketchum to the River Run parking lot, will move once again, this time to its final destination as the new lodge at the base of Rotarun, near Hailey. The move, which will begin at 10 p.m. and continue through the night into Thursday morning, will require Idaho Power to disconnect lines along the 15-mile route so the large building can pass down the streets and highway. The resulting power outages will run from Ketchum down to Buttercup Road, through Hailey and out Croy Canyon to the ski area. A spokesman from Idaho Power said the lines will be reconnected as quickly as possible to keep the disruption in service to a minimum.